Oreo was released to the public last August; by Christmas I had a selection of Android 8.0 devices to hand and as of last week only 20% of my Android estate was not running 8.0 or above, one of which was my Note 8 which had been seemingly permanently stuck on 7.1.1 and failed to get any security updates beyond Jan 2018. On Sunday evening however I did one of many weekly manual update checks since the announcement of Oreo for the Note some time back, and finally the upgrade had arrived (with last month’s security update – March 2018) with Samsung Experience 9 in tow. It’s very easy to put these back where they belong, but a pretty silly bug to have to encounter. With the notification came an indication of the new changes afoot, I’ve never needed to “enter Workspace” before. 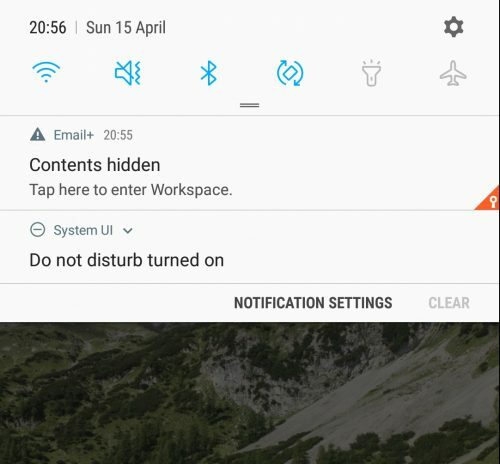 Furthermore, it took a bit of fumbling around Workspace settings to locate the notification contents settings and return it back to how I had it. It adds a bit of colour to the app drawer in any case. After re-enrolling however they all went blue. Goodbye orange briefcase! I’m thankful at least to see Samsung didn’t change everything and left the work applications displaying in the app drawer after the upgrade. Convinced with the experience above was a bit buggy, I figured I’d take the opportunity to ditch the work profile and re-enrol for a fresh Workspace experience. It’s also worth noting this “feature” only appears to work with the Samsung launcher. 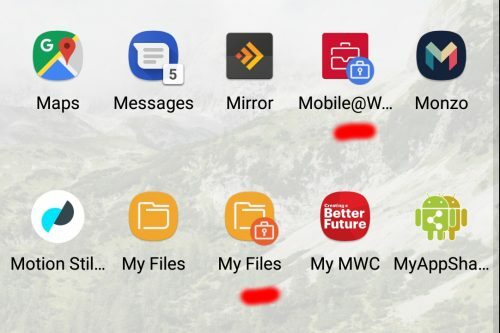 Nova, my launcher of choice for all of my BYO devices today, showed the work apps with a badge irrespective of whether that setting was toggled or not. Considering work profile is very much a BYOD tool, I’d have thought it would have been better QA’d with other popular launchers. Likely a limitation of the EMM I enrolled with, but once more notification content defaults to hidden and has to be manually permitted via Workspace settings. Samsung continues the march to make themselves different from everyone else on the market with the switch from work profile to Workspace for Android Enterprise deployments. 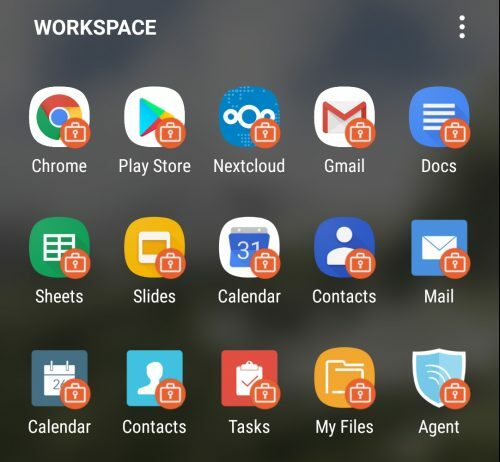 Workspace is obviously not a new solution as it’s been around for years prior to the Android Enterprise/Knox unification and offers a nice value-add for paying customers over and above the standard Android Enterprise work profile. Depending on where an organisation comes from though – be that Samsung’s Workspace with Device Administrator management, or containerisation via any other means – it could either feel familiar, or bizarre. Given Samsung have supported work profile natively for a long time and that’s been the only option for work profile deployments, I’d lean towards the latter. Based on my own lukewarm experience upgrading to Oreo and Knox experience 9, this is not going to be a smooth upgrade for many, and just as EMMs have published documentation warning of the changes, so too will organisations need to prepare their users and be prepared for unexpected changes, bugs and more. The recent launch of work profiles on fully managed devices means Workspace will no doubt end up in use with work-managed devices. For every other OEM however, organisations will have one, clear, reliable user experience. 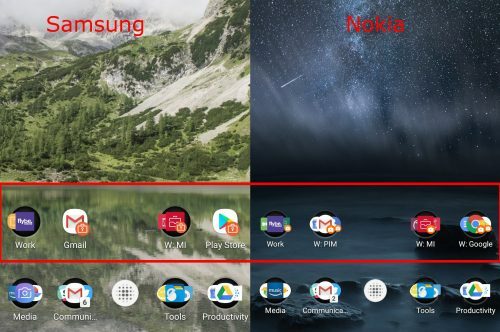 Just as with the lack of zero-touch support today, I wouldn’t be surprised if the thought of managing Workspace and work profiles would be enough to reconsider Samsung when organisations look to purchase new devices, if the Android Enterprise Recommended requirement hasn’t done that already. Have you upgraded to Oreo? Seen and experienced Workspace first-hand? What do you think of it? Let me know your thoughts in the comments, @jasonbayton on twitter or @bayton.org on Facebook. If you’re on LinkedIn, you can also find me there – /in/jasonbayton. Is there a problem with this content? Made with by @JasonBayton. Material is bayton.org 2009-2019.